Like a string of gems, our Croatia and Slovenia tour is colorful, sparkling and multifaceted. 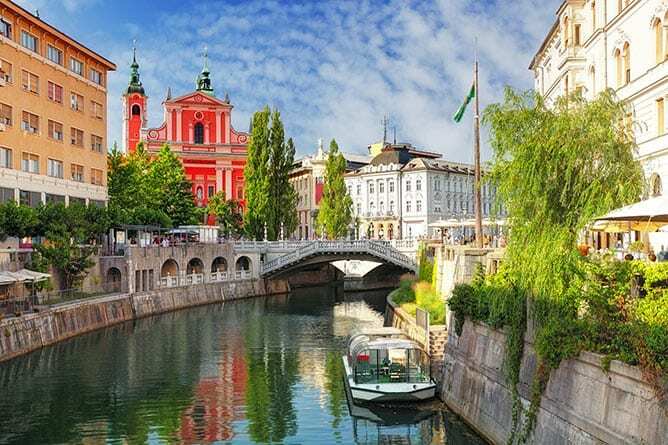 While you soak up the beautiful scenery of these Adriatic jewels, you’ll appreciate the fascinating narrative that puts these countries into historic and cultural perspective. Our loop winds past turquoise lakes, medieval castles, emerald mountains, Roman ruins and the shimmering Adriatic Sea. Highlights include a visit to the stunning Plitvice Lakes National Park (with 92 waterfalls!) and a hike around Lake Bled. This escorted tour package includes ample free time to discover the region’s many treasures. Ready to be utterly charmed? Jewels of the Adriatic is a brilliant choice for you! *Walk around Lake Bled is approximately two hours and can be strenuous for some. Depart from the U.S. on an overnight flight to Europe. Your tour includes airfare from the U.S. Single room supplement is $549. Apr 24, Jun 19, Oct 23 ’19 departures include international flights from Philadelphia. Please note there are two stops on the return flight. All other trips depart from and return to New York (JFK). For more information on tours of Croatia, please contact us here or call us during business hours (Mon-Fri, 9:00-5:30 EST) at 800-337-7773. Reservations can be made by phone (1-800-337-7773) and will be confirmed upon receipt of $300 per person non-refundable deposit which must be received within 48 hours of reservation. Full payment is due 75 days prior to departure. Baggage fees may apply. Space and prices subject to availability. For complete booking information and terms & conditions click here. Go back in time to gain an understanding of everyday life for peasants in this region beginning in the 20th century. We’ll tour the ethno-village at Kumrovec, also the birthplace of Marshal Tito, long-time president (1953-80) of the former Republic of Yugoslavia. You’ll have a chance to see Tito’s home, before we wind through the Zagorie hills to a farmhouse restaurant overlooking a 15th-century castle, where we’ll indulge in local specialties and wine pairings. All aboard a “pletna” (small boat) to the scenic island located in the middle of Lake Bled. Visit the island’s old church, which houses an impressive art collection and enjoy some free time to experience magnificent vistas. After coming back to shore, we’ll drive to nearby Lake Bohini, a resort set amidst dense woods and spectacular mountains. The trip back takes you past amazing landscapes and old Slovenian villages before returning to Lake Bled. Enjoy a delightful guided excursion to the picturesque towns that dot the sun-kissed coastline of the Istrian Peninsula. Sights include olive groves and vineyards, old villages and seaside resorts. In the port town of Pula, we’ll tour the impressive Roman Amphitheater, one of the largest of its kind in the world. In the charming resort town of Rovinj, you’ll have time to explore the narrow winding streets, small squares and Venetian-style palaces independently before returning to Opatija. You’ll feel like a character out of a classic film as you skim across the water from beautiful St. James Beach around the old city walls to St. Jakov Beach, where staff will be waiting to serve a three-course dinner paired with Dalmatian wine. After dinner, you’ll be whisked back to the old city port. Includes bus transportation to/from the hotel, as well as the exhilarating motor boat ride. See another UNESCO World Heritage Site and visit one more country! We’ll drive through the Neretva River gorge across the Bosnian border to Mostar, known for its old Turkish houses and Old Bridge, a 16th-century single arch stone bridge that was destroyed in the 1990s conflict. Our guided walking tour takes us to the recently reconstructed Old Bridge and the remains of the Turkish quarter. Here’s your chance to try Cevapcici, a traditional dish made of minced meat, when we lunch at a local restaurant. Return to Dubrovnik late afternoon. Refined comfort set in the historic part of Zagreb. Pool, fitness center and restaurants. Focused on health and well-being, with locally inspired décor. The hotel features views of Lake Bled and a large thermal pool complex. Located near the sea along the beautiful Lungomare promenade, this hotel boasts awesome views and a spa. Set in the central zone of Plitvice Lakes National Park, near Lake Kozjak. Once an office building, the hotel has been completely renovated into a four-star hotel. Just five minutes from Diocletian’s Palace. A uniquely modern property with a Renaissance garden and a pool surrounded by ancient walls. Flights from the U.S. and back are on the following airlines and schedules. Please make sure to allow sufficient time for clearing customs and immigration if you are planning a connecting flight. We recommend at least three-and-a-half hours. Please note that flight schedules are subject to change without prior notice. The above airlines do not assign seats in advance, and smarTours® is not involved in seat assignments. Seat assignments can only be arranged at the airport upon check-in. Main Tour: Land-only services start upon independent check-in at your Zagreb hotel on Day 2 of the itinerary and end after breakfast at your Dubrovnik hotel on Day 14. You must possess a passport valid for at least 6 months after the date of travel. American citizens do not require visas. Non-U.S. citizens should check with the respective consulates for current visa requirements to all their travel destinations (including Montenegro). Please remember that it is your responsibility to obtain the necessary travel documents before the trip. Weather will vary depending on location. Cities near the Alps region will be cooler, while coastal cities enjoy milder, Mediterranean weather. Evening temperatures will be cooler. The hotels used on this tour will offer dining options that range from coffee shops (where dinner, excluding drinks average about $15-$20 per person) to specialty restaurants. Your hotel will accept credit cards for your non-included meals. Optional sightseeing tours and evening activities will be offered. Optional tours can be paid for by credit card or with cash. The huge organization problem appeared on the back way during the overlay from Croatia Airline to American Airline (on 10/23/18): the time break between flights was one hour only.. The Croatian jet has delayed, and the entire group lost their connection to AA. This event has created very nervous situation for tourists, who mostly are not so young people. This case destroyed good mood after the nice, in general, trip. Smartours Croatia exceeded my expectations! Thoroughly enjoyed the tour in every respect. Suggestions-more history & detail of past & current culture by tour guide on bus, several optional tours should be part of the package(Lake Bled boat ride & Istria), More dinners in restaurants and NOT in hotels and more time in Split. Please eliminate your min. 10 characters and welcome all comments!!!! I went to Croatia and Slovenia. Had a fabulous tour director....Elvis. Lots of history and the countries are beautiful. Just returned from an amazing, well organized "Adriatic tour". Had a wonderful time. We would highly recommend this tour to everyone. It is a beautiful, scenic part of the world! Elvis Kidric our Tour Director was phenomenal. He is well informed, relatable, attentive to the needs of all group members, caring and humorous. His attention to detail was remarkable. We had an excellent driver too. We look forward to joining many more smarTours to different destinations. My sister will be going to Egypt with smarTours based on our great experience. This was a thoroughly enjoyable and educational group tour made so by our tour guide, Roc. His knowledge of the area and the history of the former Yugoslavia was extraordinary. His best skill was keeping the group under control and on time. Hotels and meals were great and the sights were memorable. We highly recommend this tour. This was my 19th trip with smarTours in 21 years – and it was absolutely wonderful! My first visit to the area (formerly Yugoslavia) was 41 years ago, and the beauty of the countries brought me back 14 years ago with smarTours. Our guide Rok filled our minds with the incredible history of the area – from ancient times to current. Meanwhile, we absorbed the breathtaking scenery in the care of our most capable driver Sludgen, as he navigated the winding roads through and around the mountains. Someone commented that the Dalmation Coast of Croatia was more beautiful than Italy's Amalfi Coast (or our own California coastline, for that matter). Absolutely true, because the Croatian coast is probably longer. There are 1,000 islands that parallel it, and the mountains seem to tumble into the turquoise waters below. All along the drive, from Zadar to Montenegro, communities with red-tiled rooftops dot the bays and inlets. For anyone who loves culture and history, this is the trip for you – but if you just want to absorb absolute beauty, you won't be disappointed! Our recent "Jewels of the Adriatic" trip was one of our best ever. Our tour guide Valentina was to quote an old saying is "AS GOOD AS IT GETS" She is bright, delightful, knowledgeable person who went far beyond the norm to insure every minute of our tour was safe, interesting and a learning treat. We can't say enough....A JOB WELL DONE. From lakeside castles to shimmering coastline, mountains, terraced lakes, waterfalls, walled cities, Roman ruins...Croatia and Slovenia were one fabulous surprise after another! Our tour director, Elvis, guided us with humor and patience. His stories made the distant and recent histories of these countries come alive for us. This was my first experience with SmarTours, and I will definitely be coming back for more! This trip with Smartours through Croatia, Slovenia, Bosnia and Montenegro was one of the best I've experienced.. Our guide, Rok was very informed and and shed light on the complex history of the area. The balance of the guided and the free time was excellent and the hotels and accommodation very nice. I am recommending smarTours to others as well. They are a great value for a very quality trip. We have traveled through many parts of Europe, most of the trips organized on our own. This trip with Smartours through Croatia, Slovenia, Bosnia and Montenegro was just awesome. Honestly one of the most beautiful areas we have ever seen. We learned so much about the history of this area besides seeing the beautiful views and towns and so much about the people and their struggles. Our guide Rok did a fabulous job of keeping the group organized and on time and in telling us so many facts about the cultures, history and much about the recent history through Communism and the 1990's wars. The trip was relaxing as everything was organized and timely. Our hotels were all excellent. Many meals included. Typically a nice overview guided tour was offered of each new location but you have very much time on your own to explore. The other members of the tour were very nice and we all enjoyed a common bond early on in the trip. Bottom line is I would highly recommend Smartours for your next trip. They are a great value for a very quality trip. We certainly will be using them again! Terrific tour, it covered some beautiful country. Our guide, Elvis, was wonderful. He shared insight, stories, and history of the region very nicely, had good wine recommendations(! ), and was a pleasure to be with each day. Hotels were very good and well located, the bus was new and very comfortable. We were about the only first-time smarTours travelers on the bus, most others had traveled with them for years. I think we will join them! Thank you for a relaxing holiday, smarTours.